During the fall 2016 shows at Paris Fashion Week Balenciaga, Vetements, and Acne Studios managed to turn functional coats into trendy pret a porter wear. We found the coats at Balenciaga remarkable; They are fresh and young: seems for a different woman than the Balenciaga one used to be; more trendy. We now know why; this show was the debut of Vetements designer and new artistic director of Balenciaga Demna Gvasila. Vetements is the hottest brand in town nowadays; Fall 2016 was the last collection for Demna Gvasila. Other Brands such as Celine also managed to transform functionality into fashion in a less radical way; presenting Wax (trench) Coats in a more demure colorscheme. Like Acne Studios, Stella McCartney also incorporated the very functional Down Jacket. McCartney used the garment almost as a basis for her Fall 2016 collection. Unlike at Acne Studios she didn’t take away it’s functionality; to keep us warm. No, she transformed the down jacket into al kinds of shapes; from cropped to oversized, from day to evening wear. Fashion Fairy Tales: Little Red Riding Hood. Yes! it’s time for dreams again at the Fashion Shows for Winter 2014. Little Red Riding Hood is stomping through the woods, not only wearing her cape. No, this season she owns more than just a cape, she’s wearing the killed bloody wolf on her shoulders as well! Coats and dresses made of red fur sure make do as really fancy showstoppers! Prints and patches of wolves, squirrels, birds, forests and the actual Little Red Riding Hood story are placed on her wardrobe as well. (Pre-) Fall 2014: All that Fur. It seems like there is a fashion show held every single day of the year! The fashionable human species has killed the seasons as they were once intended. We, at Mimi Berlin are happy to go along with that, we will report on Fall, Pre-Fall, Spring, Summer, Couture, Winter and what have you not all at the same time. Or better even, we will report when we feel like it. Last week, from January 7, 2014 through January 18, 2014 the women’s wear collections for Pre-Fall 2014 were presented. Pre-Fall? Yes that’s a season as well. It’s the same as Mid-Season. We, at the Mimi Berlin offices always loved that term: “You can wear your Mid-Season coat today Beja, it’s getting chilly outside” It does sound better than “Pre-Fall coat”. Anyways, these collections are small in-between-capsule-collections and they are filled with fur, fur and more fur, of the glamorous kind. The menswear Fall 2014 fashion shows were held from January 6, 2014 through January 19, 2014. Again the designers made lot’s of use of fur, fake or real, we don’t know, and in the end that doesn’t matter because it’s a trend, it will be picked up by high- and low-end brands. 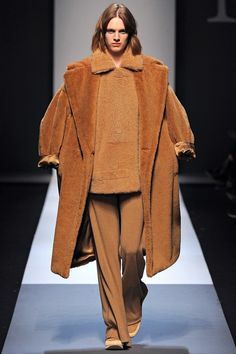 Fur for men in Fall 2014 was mostly used for Knee lenght coats, scarves and sweaters. 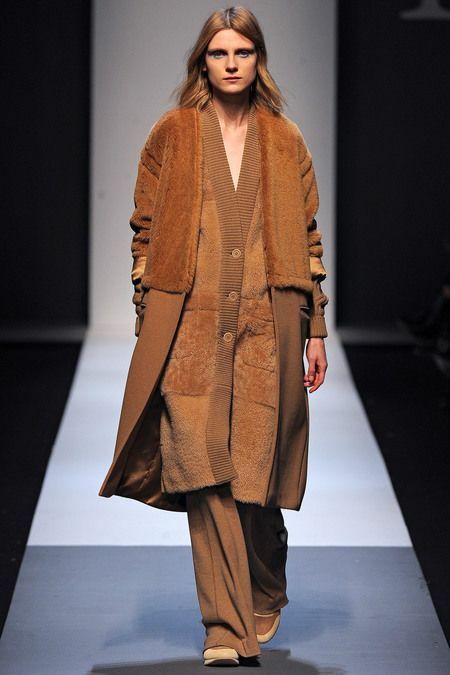 For Max Mara the cashmere warm, cosy beige coat is a trademark. 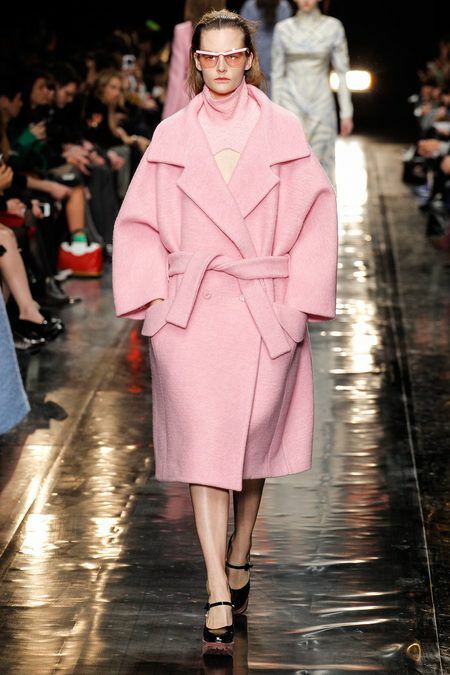 Max Mara really is the best this season! They are the number one Teddy Bear makers. Celine, a dress in fur…. Remarkable how much fur was used this F/W 2013 season, and not only by the Italian designers. And not only for coats. Accessories, embellishments, dresses, tops etc etc can be find in fur allsorts.